Boston flight control begins notifying the chain of command that a suspected hijacking of Flight 11 is in progress. Those notified include the center’s own facility manager, the FAA’s New England Regional Operations Center (ROC) in Burlington, Massachusetts, and the FAA Command Center in Herndon, Virginia (see 8:28 a.m. September 11, 2001). [Federal Aviation Administration, 9/17/2001 ; 9/11 Commission, 8/26/2004, pp. 11] According to the 9/11 Commission, this is consistent with FAA protocol: “From interviews of controllers at various FAA centers, we learned that an air traffic controller’s first response to an aircraft incident is to notify a supervisor, who then notifies the traffic management unit and the operations manager in charge. The FAA center next notifies the appropriate regional operations center (ROC), which in turn contacts FAA headquarters.” [9/11 Commission, 7/24/2004, pp. 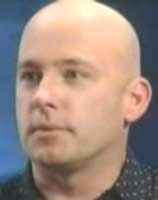 458] But according to Ben Sliney, the national operations manager at the FAA’s Command Center, “the protocol was in place that the center that reported the hijacking would notify the military.… I go back to 1964, where I began my air traffic career, and they have always followed the same protocol.” [9/11 Commission, 6/17/2004] Yet Boston Center supposedly will not contact NORAD about Flight 11 until about 12 minutes later (see (8:37 a.m.) September 11, 2001). Already about ten minutes have passed since controllers first noticed a loss of contact with Flight 11 (see (8:15 a.m.) September 11, 2001). 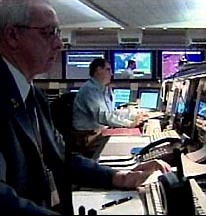 Boston reportedly also contacts several other air traffic control centers about the suspected hijacking at this time (see 8:25 a.m. September 11, 2001). National Operations Manager Learns of Hijacking - A supervisor at the Command Center promptly passes on the news of the possible hijacking to Ben Sliney, who is on his first day as the national operations manager there. 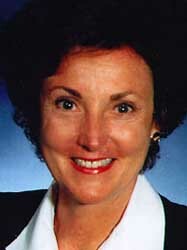 The supervisor says the plane in question is “American Flight 11—a 767 out of Boston for Los Angeles.” According to author Lynn Spencer, “Sliney flashes back to the routine for dealing with hijackings from the days when they were more common.” The procedure is to “[k]eep other aircraft away from the errant plane. Give the pilots what they need. The plane will land somewhere, passengers will be traded for fuel, and difficult negotiations with authorities will begin. The incident should resolve itself peacefully, although the ones in the Middle East, he recalls, often had a more violent outcome.” Apparently not expecting anything worse to happen, Sliney continues to the conference room for the daily 8:30 staff meeting there (see 8:30 a.m.-8:40 a.m. September 11, 2001). Bruce Barrett. [Source: H. Darr Beiser / USA Today]The FAA’s New York Center declares “air traffic control zero” (“ATC zero”), which means that all air traffic is prevented from departing from, arriving at, or traveling through the center’s airspace until further notice. [USA Today, 8/12/2002; Freni, 2003, pp. 18; 9/11 Commission, 8/26/2004, pp. 24] According to author Lynn Spencer: “ATC zero is designed for situations in which an air traffic facility is completely incapable of handling aircraft due to a massive computer failure, power outage, or even a large enough weather system. The declaration pushes all their aircraft onto neighboring sectors, and any new airplanes from adjacent sectors are turned back, at the sector boundaries if necessary.” [Spencer, 2008, pp. 68] The decision to declare ATC zero is made after the second plane hits the World Trade Center, confirming that the US is under terrorist attack. There are currently hundreds of aircraft in the skies around New York and the western Atlantic that the New York Center is responsible for. [Associated Press, 8/12/2002] Bruce Barrett, a senior manager at the New York Center, announces, “We’re declaring ATC zero,” and Mike McCormick, the center’s air traffic control manager, approves the order. Several of the managers there then start informing air traffic controllers of the decision. Military officers at the FAA’s Command Center are informed of the hijacking of Flight 93, according to the FAA’s National Operations Manager Ben Sliney. If such notification is given, it is presumably shortly after the Command Center learns of the hijacking (see 9:34 a.m. September 11, 2001). Sliney will later tell the 9/11 Commission: “Available to us at the Command Center of course is the military cell, which was our liaison with the military services. They were present at all of the events that occurred on 9/11.” He will add, “The normal protocols for the events that were transpiring then—that is to say hijacked aircraft, which requires a notification to NORAD—those, at least I was given to understand, were made promptly—the notifications on each hijack.” The FAA’s acting Deputy Administrator Monte Belger will add: “[T]here were military people on duty at the FAA Command Center, as Mr. Sliney said. They were participating in what was going on. There were military people in the FAA’s Air Traffic Organization in a situation room. 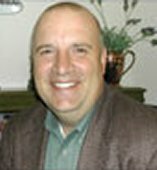 They were participating in what was going on.” [9/11 Commission, 6/17/2004] If the cell is notified, it is unclear what, if anything, the military liaison officers—Colonel John Czabaranek, Lieutenant Colonel Michael-Anne Cherry, and Major Kevin Bridges (see (Between 9:04 a.m. and 9:25 a.m.) September 11, 2001)—at the Command Center do with the information about Flight 93’s hijacking. The 9/11 Commission will say that the first notification to the military about Flight 93 comes at 10:07 a.m. (see 10:05 a.m.-10:08 a.m. September 11, 2001). 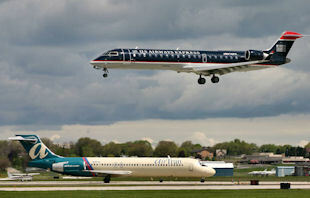 General Mitchell International Airport in Milwaukee, Wisconsin. [Source: VisitingDC.com]Attorney General John Ashcroft insists that the plane he is traveling on take off from Milwaukee and head to Washington, DC, even though he has been discouraged from getting airborne due to the possibility of further attacks, and his pilot has been told by air traffic control that he will not be allowed to take off. [Ashcroft, 2006, pp. 117; Spencer, 2008, pp. 257-258] Ashcroft was flying from Washington to Milwaukee in a Cessna Citation V jet when he learned of the attacks in New York in a phone call with the Justice Department command center. He’d wanted to immediately head back to Washington, but his pilot, David Clemmer, said they would first need to land in Milwaukee to refuel (see Shortly After 9:03 a.m. September 11, 2001). Their aircraft then landed, presumably at Milwaukee’s General Mitchell International Airport. SWAT Team Surrounds Plane - After the plane touched down, Ashcroft and the others on board were met by a SWAT team, brandishing weapons, which surrounded the plane. Then, while Clemmer took care of refueling, Ashcroft and his fellow passengers—some colleagues of his from the Justice Department—went into the airport’s evacuated terminal and found a television on which they could watch the news coverage from New York. Soon after, they learned that the Pentagon had been hit. The plane carrying Attorney General John Ashcroft is ordered to land by the FAA’s Cleveland Center, but Ashcroft is intent on reaching Washington, DC, and instructs his pilot to ignore the order. [Federal Aviation Administration, 3/21/2002 ; Ashcroft, 2006, pp. 117; Spencer, 2008, pp. 258] Ashcroft learned of the attacks in New York while flying to Milwaukee in a small government jet, and immediately wanted to return to Washington, but his plane needed to land first in Milwaukee to refuel (see Shortly After 9:03 a.m. September 11, 2001). 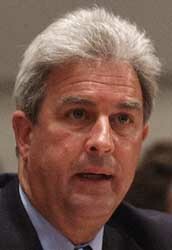 Even though the FAA had issued a nationwide ground stop to prevent aircraft from taking off, Ashcroft then insisted that his plane leave Milwaukee to fly back to Washington (see After 9:37 a.m. September 11, 2001). Fighters Intercept Ashcroft's Plane - When Ben Sliney, the national operations manager at the FAA’s Herndon Command Center, hears that Ashcroft’s pilot is refusing to land, he notifies NORAD’s Northeast Air Defense Sector (NEADS). As a result, two F-16 fighter jets from a nearby Air National Guard base intercept Ashcroft’s plane, but they remain out of sight and undetected by its pilot. The F-16s’ pilots report to NEADS that the errant plane is a private corporate jet without any markings, which is heading for Washington and does not seem to have any intention of landing. Pilots Send Signal Indicating a Hijacking - Flight 85 entered the Anchorage Center’s airspace at around 1:00 p.m. The air traffic controller there who is handling the flight queried the pilots to determine whether their plane had been hijacked. He used a code word when speaking to them, as a way of covertly asking if the plane was hijacked, in case the crew was unable to speak openly over the radio. However the pilots offered no reassurance that their plane was secure. Instead, at 1:24 p.m., they switch the plane’s transponder (a device that sends information about an aircraft to controllers’ radar screens) to “7500”: the universal code that means a plane has been hijacked. This action sets off “a frenzy of activity,” according to USA Today. Within minutes, Alaska’s governor orders the evacuation of the Trans-Alaska Pipeline, as well as the evacuation of federal buildings and all large hotels in Anchorage. 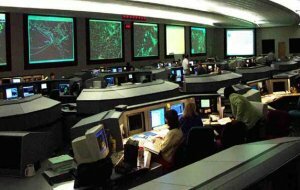 FAA Wants Flight to Remain on Current Course - However, officials at the FAA’s Command Center in Herndon, Virginia, are unconvinced that Flight 85 has been hijacked, and advise the Anchorage Center controllers not to redirect it. The Command Center is in contact with Korean Airlines headquarters, which is emphatically stating it has received no indication that Flight 85 is in trouble. Ben Sliney, the national operations manager at the Command Center, urges the Anchorage Center controllers to keep seeking clarification from Flight 85’s pilots about the status of their aircraft. [USA Today, 8/12/2002; Spencer, 2008, pp. 277-278] But NORAD will instruct the controllers to direct the plane away from Anchorage (see (Shortly After 1:24 p.m.) September 11, 2001). [Anchorage Daily News, 9/8/2002; Spencer, 2008, pp. 278] Flight 85 will continue transmitting the hijack code from its transponder until it lands in Canada at 2:54 p.m. (see 2:54 p.m. September 11, 2001). Only then will officials be able to confirm that the flight has not been hijacked (see September 12, 2001).